Today I worked on configuring forms based authentication for SharePoint 2010. 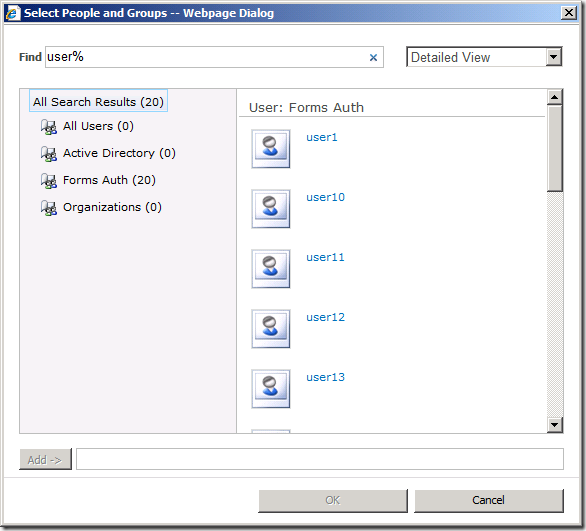 Using forms based authentication automatically means using claims based authentication in Sharepoint 2010. I tried using both an LDAP provider and a SQL provider. My initial goal was to get them both working in the same environment, but after a lot of hours of staring at XML in web.config files I gave up on that one. Instead I created separate environments for using LDAP and SQL providers. Because of this I will also write two separate blog posts. 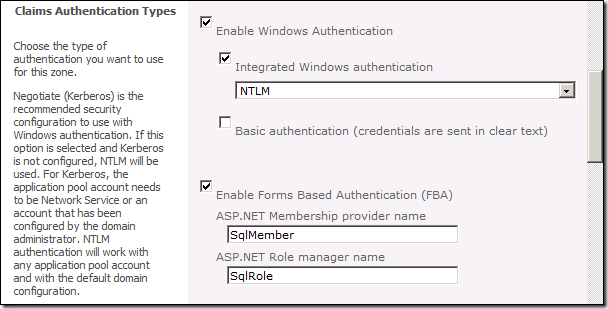 This one will explain how to set up forms based authentication while using a SQL provider. If you want to configure forms based authentication for use with an LDAP provider check out my other post here. Using a SQL provider with forms based authentication means that users will use usernames and passwords that are stored in SQL Server Database. They will use a sign-in page to fill in their credentials and log in. On the database server, open Windows Explorer. Navigate to the path %System Drive%\Windows\Microsoft.NET\Framework\v2.0.50727. To start the ASP.NET SQL Server Setup Wizard, double-click aspnet_regsql.exe. * Start the MembershipSeeder tool. * In the dialog box that opens, type the name of the computer running SQL Server that hosts your SQL membership database. * Save your changes, and then restart MembershipSeeder so that it will use the new server name. * In the User Prefix field, type a value. * In the Password field, type the password you want each user to have. * In the # of Users field, select the number of users to create. Double check whether the <membership> and <rolemanager> entries only exist ones. Delete any double entries. Click the Address Book icon. Type in the NT login name or account name and click the search button. If it’s working correctly you should see at least two entries for the account – one that is for the user’s Active Directory account, and one that is for that same account but which was found using the LDAP provider. You can now browse to the web application and log in using forms based authentication. I also want to thank Spence for his help and advice.